We drank three rather unusual wines this weekend. On Friday, we attended a clambake with three other couples. The event was hosted by Richard Clark, our wine co-op wine maker and his wife, Mary Stec, at their home. In addition to fresh Maine lobsters, mussels, clams (including belly clams), Jonah crab claws, chorizo sausage, etc., etc., there were two very special wines (among several). First, Richard brought a 1998 Abbazia di Novacella (Stiftskellerei Neustift) Weiss Praepositus out of his cellar. That mouthful is actually a northern Italian white wine that obviously from the part of Italy near Switzerland. 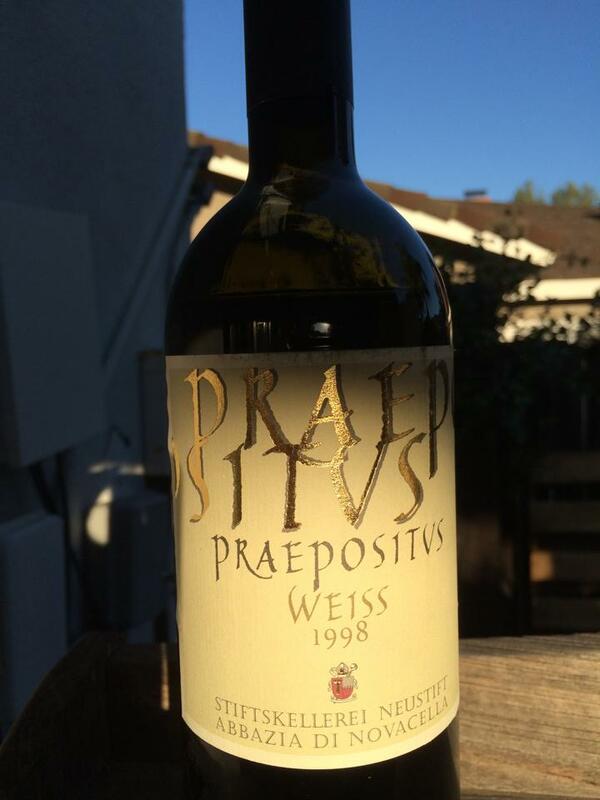 The 1998 Praepositus Weiss is a white blend – I was unable to find the specific varietals included, although they grow Sylvaner, Grüner Veltliner, Kerner, Pinot Grigio and Müeller Thurgau grapes in the producer’s vienyards. The winery, Abbazia di Novacella, is a monastery. The wine was very dry and lacked an strong sense of fruit, both on the nose and in the mouth. The color was golden yellow – the wine had aged well, and if anything, it seemed like it could use a few more years in the bottle, even though it was a 1998. Hints of earth and minerality showed. The wine was a good accompaniment to the seafood, and it lasted about ten minutes with four couples present. 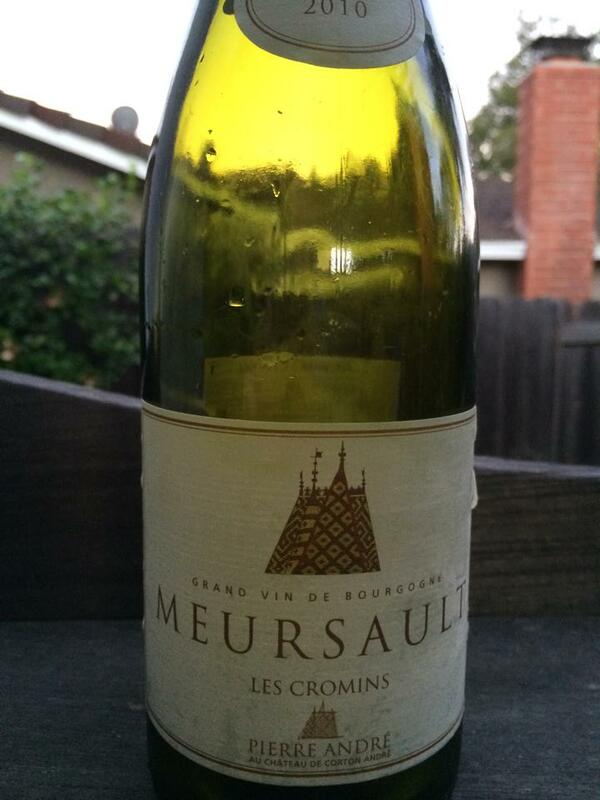 The second wine was one that I brought, a 2010 Pierre-Andre Les Cromins Meursault from Burgundy. Dorianne and I purchased the bottle at the winery north of Beaune, when we got lost. The welcoming sign of a chateau with a wine barrel with two bottle sitting atop it caused us to turn off of the road. We had a wonderful time exploring the caves beneath the chateau and tasting some amazing wines. A couple from Australia was there on an around-the-world trip, so we had a nice conversation with them. The Meursault was, well, delicious. The nose was both fruity (pear, green apple) and herbaceous at the same time. The wine was very smooth and was a perfect accompaniment for those Maine Lobsters. The next evening, we had to help Mary and Richard polish off all that seafood. Mary decided to make a cioppino – and she made a beautiful one! I scoured my wine cellar (actually located in about 6 places around the house – need to attend to that soon), for something red, Italian, and not too acidic to go with the tomato in the cioppino. I found a bottle of 2009 Marangi Negoramaro that I had purchased a year or so earlier from Wines-Till-Sold-Out. 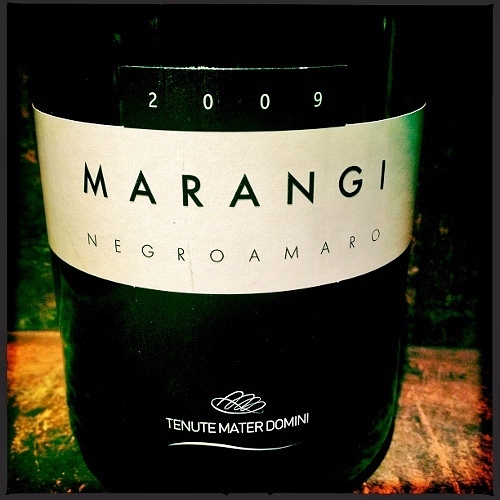 I was curious about the fairly rare Negroamaro varietal. The wine is very dry, moderately tannic and acidic, herbaceous with hints of leather and dirt on the nose. The taste was more of the earth than the fruit. I went perfectly with the cioppino in my opinion. Dorianne preferred the Pinot Noir from Tolosa in the Edna Valley provided by our host. I recalled that Dorianne had not really liked the wine when I opened the first bottle a while back. She is consistent! I am not sure if you can find any of these wines easily or at all. I thought I would share the experience, because it is fun to explore and to hear about the unusual. What unusual wines are you drinking lately?